Vegetables play a crucial role in the human diet, being relevant contributors to the intake of micronutrients (i.e., vitamins and minerals) and dietary fiber and prebiotics, as well as occasionally of digestible carbohydrates and proteins (e.g., tubers and pulses). Furthermore, beyond their nutrient composition, vegetables contain a range of non-essential bioactive compounds (i.e., phytochemicals), among which carotenoids and polyphenols, including flavonoids, phenolic acids, stilbenes, lignans or tannins, are prominent, with others such as glucosinolates (in Brassicaceae), cysteine sulfoxides (in Allium species) or betalains (in beets) having more limited distribution. Phytochemicals have attracted much attention in recent times as they may provide additional health benefits to the consumption of vegetables and other plant foodstuffs. The dietary intake of these compounds has been related with the prevention of some chronic and degenerative diseases that constitute major causes of death and incapacity in developed countries, such as cardiovascular diseases, type II diabetes, some types of cancers or neurodegenerative disorders like Alzheimer’s and Parkinson’s diseases. Nowadays it is considered that phytochemicals contribute, at least in part, for the protective effects of fruit and vegetable-rich diets, so that the study of their role in human nutrition has become a central issue in food research. Consumers more demand for healthy and nutritious natural foods, while they are increasingly reluctant to chemical additives. These are requirements that fresh or minimally processed plant foods like vegetables can meet. Nevertheless, time constraints in developed countries have led to a decreasing tendency in the preparation of daily meals based on fresh ingredients. In this context, phytochemicals-rich foods are of great interest for both consumers and food industry that can use them as sources of bioactive ingredients for functional foods, nutraceuticals or dietary supplements. Moreover, owing to their properties, some phytochemicals might be used as natural additives, like antioxidants, preservatives, colorants or taste enhancers. Last but not the least, their bioactivity makes them also interesting to pharmaceutical and cosmetic industries for the development of drugs or cosmeceuticals. Acknowledged experts in their fields have collaborated in the preparation of this book under the coordination of Prof. Spyridon A. Petropoulos, Prof. Isabel C.F.R. Ferreira and Dr. Lillian Barros. Throughout 12 chapters, a comprehensive overview is provided on the main groups of cultivated edible vegetables, as well as on some particular less used or locally employed native species that might be promoted for larger use in human nutrition. The coverage is ample, while the main focus is put into the interest of vegetables as phytochemicals sources, aspects such as plant description, chemical composition, influence of breeding, post-harvest or processing on bioactive compounds, health effects, bioaccessibility or bioavailability are also dealt with. No doubt that the book will be very useful for academic and industrial scientists, but also for students and consumers concerned about their health or who wish to delve into the knowledge of vegetables, their nutrient and phytochemical composition and their undoubted relevance in the human diet. 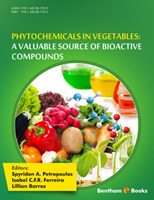 The present e-book aims at presenting the phytochemicals content of the main cultivated vegetables, as well as their health and therapeutic effects based on ¬in vitro and in vivo, animal and clinical studies. The importance of vegetables on human health is mostly attributed to their nutritional value; however, not always nutrients are the sole responsible compounds for such properties and several other compounds can also contribute to health-promoting effects. These compounds have been identified as secondary metabolites and plants usually synthesize them for their own protection from pests and diseases or their biosynthesis is triggered under specific environmental conditions. Book structure has been arranged in individual chapters, each one of them dealing with specific groups of vegetable sources of phytochemicals, either in terms of taxonomy (species of the same family) or in terms of edible parts morphology (e.g. leafy and root vegetables). For each species, a short introduction regarding the description of morphology, taxonomy and general information is included, as well as its chemical composition and its main health effects. Chapter 1 presents the main phytochemicals that have been identified in various roots vegetables consumed throughout the world, including potato, celeriac, turnips, radish, beets, Hamburg parsley, taro, yam, parsnip and salsify. Chapter 2 presents vegetables that belong to the Allium genus. Chapter 3 presents bean, a vegetable of the Fabaceae family, which is one of the main starch and protein sources for most of the world. Chapter 4 demonstrates the chemical composition and health effects of another group of vegetables that all belong to the Cucurbitaceae family. Chapters 5-7 provides a clear insight into a diversified group of vegetables that are consumed for their edible leaves, belonging to Asteraceae and Apiaceae families. Chapter 8 discusses the phytochemicals content, their functionality and breeding tools for the enrichment of cole vegetables (Brassicaceae) in phytochemicals. Chapter 9 presents another important group of fruit vegetable that belongs to the Solanaceae family, namely, tomato, eggplant and pepper. Other important vegetables, such as globe artichoke and okra, are characterized in chapters 10 and 11. Finally chapter 12 deals with a special group of fruit and vegetables, which although they have a regional interest and are less well-known, they present important bioactive properties and health effects.